If you are new to Tumblr, then you should know how to use Tumblr Account and want to know about its features as well. Without knowing the available features, we can’t use a resource effectively. 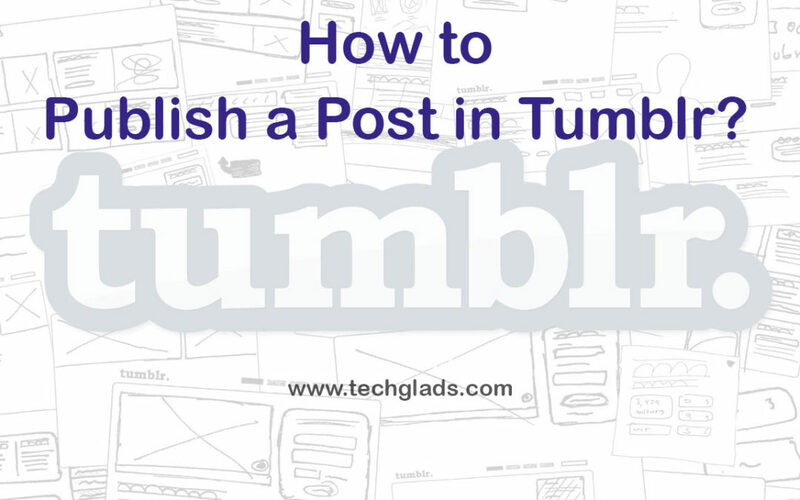 Just follow the steps mentioned below to publish a Tumblr Post. If you are a New User, check the Steps to Create a Tumblr Account. After a successful login, it will point you to the Tumblr Dashboard. Click on “Aa Text“, to publish a post now. To Publish a Post, you will have an option like Title, Text and Tags. In Title section, you want to add a Title of the Blog. The title will show you what the content is about. In the Text section, you want to explain the content in brief including links, Images and more. In the Tags section, you want to add the most related tags to that particular post. 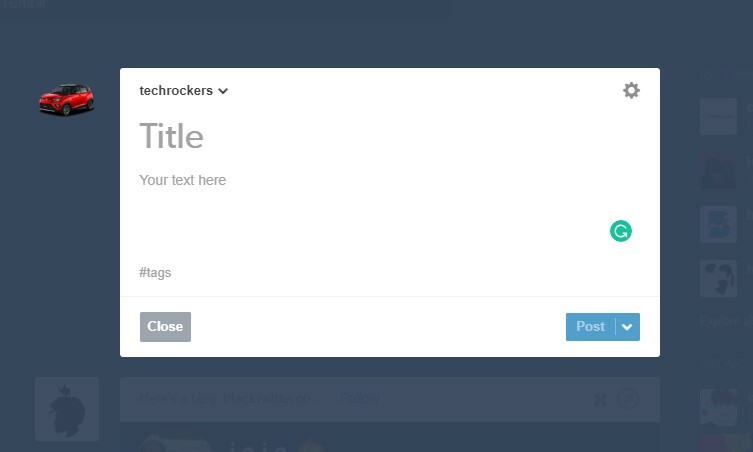 Tags play a major role in Tumblr. Custom URL – You can suggest the Custom URL for your Blog. If you are an SEO person, then you can alter the URL as SEO Friendly URL. Custom URL will help you to create some meaningful and User-Friendly URL. Content Source – If you want to publish this post by mentioning one of your related post as a Source, then you can add it here. If you feel that, the content published by you is sensitive then you can enable this option. So people who marked their account as Safe Mode will not see those texts. In Tumblr Post, there is three text editor available and they are Rich text, HTML and Markdown. You can choose the one which is comfortable for you and which satisfies your needs. If you didn’t complete the post, then you can save it in the draft using this option. So you can come again later to check this and to publish it. 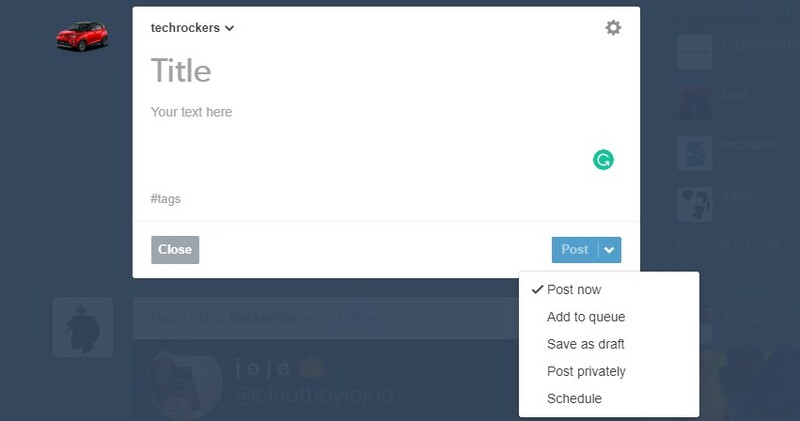 If you want to post the content privately, to check how it looks or to maintain a private blog then you should choose “Post Privately” option. It will be visible only for you and other people can’t make see your post. A schedule is one of the smart options for regular bloggers. It is not possible to complete and publish the blog on a regular time. So sometimes it may take more time or sometimes even shorter. So you can schedule your post to get published at a particular time exactly. On that scheduled time, your post will get published without any request.